Jon Bales is founder of a new Milwaukee organization, the Urban Aquaculture Center, dedicated to demonstrating how urban fish production can become a sustainable foodproducing industry. Milwaukee has an unprecedented opportunity to remove itself from its rustbelt city image and move in a purposeful direction using a new set of tools. It can do this by embracing the latest in green innovation and becoming recognized as a leader in urban agriculture. Many local organizations are working tirelessly to bring the local food movement into the city with new urban ideas, encouraging future generations to get back to the land and grow and eat close to home, rather than importing from places far off. “Pollinating our Future,” a conference at the end of February, sponsored by the Michael Fields Agricultural Institute, addresses barriers to urban agriculture and brings together a diverse group of urban agriculture presenters. The Urban Aquaculture Center, a proposed large-scale production and educational facility, is hoping to bring Milwaukee into the twenty-first century in terms of fish production and to provide an innovative solution to several environmental problems involved with fish. Past “Peak Fish” The first humans were pushed out of being hunters and gatherers because of changing conditions. Anthropologists tell us that the Neolithic Era began when the human population replaced hunting and gathering with farming practices, which became a more practical means of ensuring a consistent food supply. An exception to this new practice of farming was gathering fish from the oceans and lakes all over the world. When it comes to fisheries, we are still hunting and gathering with modern efficiencies that have put the earth past “peak fish.” A team of North American and European marine biologists and economists reports that at the current rate, our ocean’s fisheries will collapse by 2048. It is now evident that this practice of gathering fish is unsustainable. Marine capture fisheries have reached a ceiling, and we humans must now contemplate the alternative and refine our fish farming skills. 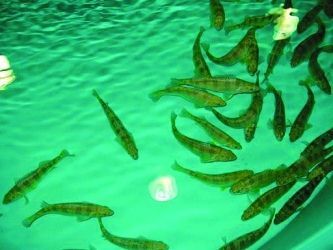 As aquaculture continues to feel the pressure to expand, research and development must keep up to minimize the difficulties inherent with this emerging industry. Proper design, analysis, and implementation of an urban fish farm are necessary to insure its success. This means a thorough feasibility study is needed by the stakeholders, including the public. Generally, a government’s commitment to provide increased support to the aquaculture sector is a prerequisite for the sector’s sustainable development. Farming fish as an urban enterprise needs to be developed with the best management practices available. Sushi Anyone? The United States lags behind Asia, particularly China, which accounts for over 90% of the world’s aquaculture. We import fish from far-away countries which results in a seafood trade deficit of over $8 billion annually. According to the United Nations Food and Agriculture Organization (FAO) which makes a comprehensive study of the state of the world’s aquaculture every two years, the US, Canada and Mexico combined account for only 1.3% of the world’s aquaculture. China leads the world as the largest producer and consumer of farmed seafood, accounting for almost 70% of the total. Viable cities of the future will require a consistent, clean source of protein, produced locally, under secure conditions. We cannot be surprised if in the future we see a ban on the harvesting of fish from the wild for all purposes other than recreational fishing in order to preserve what remains in the world’s depleted oceans. Thinking in Cycles Within ten years, the industry of aquaculture will supply most of the fish protein consumed in the world. The reason will be that we simply cannot sustain the wild capture of fish where sizes and numbers are diminishing, and whose bodies contain increasing amounts of undesirable pollutants such as mercury and PCBs. Aquaculture systems involving organic polyculture or using water to grow top-of-the-food-chain species, and then reusing it in descending order by less dominant marine species such as shrimp and snails, is more sustainable than a monoculture system. Finally, the nutrient-rich effluent water is used by plants to mimic the same carbon cycle begun billions of years ago. Plants thrive on the waste products of other plants and animals. Cities need to begin farming fish for a variety of reasons. Foremost is the shortage of certain well-known favorites such as yellow perch, which has declined substantially from Lake Michigan. Cities are where the market and labor pool are, and in Milwaukee there are plenty of vacant buildings and plenty of fresh water. In a recirculating system, the water can be cleaned up, possibly by plants, and reused. With a bio-mimicking technique, fish farming could be combined with growing plants and made into a profitable urban industry. Urban Aquaculture The Urban Aquaculture Center was founded with the idea of demonstrating how urban fish production can occur in a sustainable manner. The Urban Aquaculture Center is currently seeking funding and a location where it can house an educational campus to showcase sustainable urban fish farming practices.